"There is a plane of experience, other than the three dimensional plane, which can be felt by a human being...If people never get above the merely signal level of communication, and don't become telepathic, they haven't explored their full human birthright." "We are all parts of God. Each one of us has an electrical body field that surrounds us, and a mind field that goes on to infinity." In meditation, the subjective nature of Time becomes all too obvious. Sometimes, an hour zips by. At other times, I've imagined that I felt like a dazed prizefighter hanging onto the ropes of a painful existence waiting forever for the bell to ring. And that's only one hour. As I get older, it becomes increasingly impossible to grasp the nature of concepts like a "year". These days it feels easier at times to sense the mysterious nature of the Timeless in the boundless expansiveness of each moment. I guess my head sort of goes to that place whenever Stephen Gaskin crosses my mind as it did this morning. 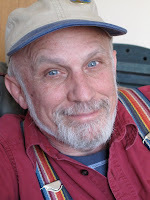 It seems surrealistic to me that it has been four years since he passed away at age 79 at his home on the Farm, the intentional spiritual community he had helped to found in rural Tennessee in 1971. More than anyone, Stephen's teachings informed my ideas about the nature of Reality and the work to be done during our sojourn on this planet. I came across his rendition of the Bodhisattva Vow for the first time in The Farm's first book Hey Beatnik! I was hooked. At that moment the vow took me. A decade older than many of the young folks who flocked to San Francisco in the mid-sixties as part of the Psychedelic Revolution, Stephen always maintained he was more of a Beatnik than a Hippie. 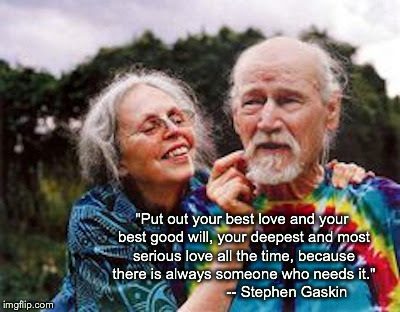 Yet, wearing tie-dyes til the end, Gaskin was a central figure in the burst of spiritual energy that encircled the globe during the 1960's and 70's, catapulting many of us into a Collective Kensho that transformed our lives. 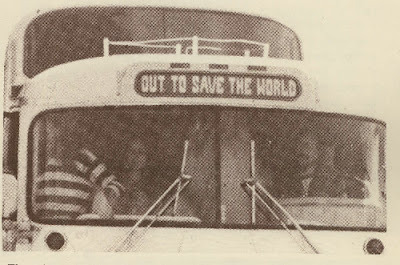 Claiming that they were "out to save the world," Gaskin and 50 bus loads of Hippies left San Francisco to circle in for a landing in Tennessee to form what was, for a time, the largest hippy commune in the world. Although the size and structure evolved over the years, The Farm is still there. Yet, as the years rolled on it became more and more obvious to me that spiritual practice wasn't about the Big Flash's and Psychic Powers. At any one moment, the Practice is about simply being Present, opening your heart and mind enough to engage life directly in a kind and helpful way. This calls for honesty and deep self-honesty. It calls for getting out your head enough to stay in touch with the feelings, energies, and "vibes" of a situation, hanging in there to try to help out even when you or somebody else blows it. This Practice continues to be, as Stephen once characterized it, "an exacting discipline." As legend has it, Stephen sat with Suzuki-Roshi at the San Francisco Zen Center (Suzuki's photos and quotes begin both the book This Season's People: a book of spiritual teachings by Stephen Gaskin and Hey Beatnik!). Yet he maintained that although he honored all the "old religions", the religion that he and his friends were practicing had no name. "It lives in the hearts of the people, " Stephen said. "It is the practice of real love, impeccable correctness and politeness and care among each other..."
I can't think of any better way to see it, say it -- and try to be it. That's why I create time to Sit most mornings, why I still recite the Bodhisattva Vows most days. It's about learning how to love more completely. Love is where time and the Timeless merge. As I wend my way through the last laps of this most amazing run called "my life", I can't think of anything better to do. Currently I'm somewhere between buddachita and the shambala gun club. Agreeing with Stephen on this and as far as I'm concerned the true nature of reality is accessible to anyone properly prepared without the adherence to any particular religion. Religions arise out of a great teachers encounters with this reality and celebrate their life and teachings but Buddha was not a Buddhist and Christ was not a Christian.